The Tom Tom Spring Summit and Festival features inspirational conferences during the day, and then at night, hosts a block party and performances to celebrate the community! The event will take place April 8th through 14th, at various locations around Charlottesville. 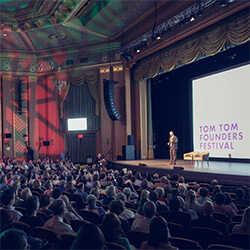 The Tom Tom Foundation is a nonprofit organization that celebrates entrepreneurs, civic leaders, and creators who are shaping cities and communities across the nation. Lakeside’s location is unparalleled with the serene 12-acre lake, white sand beach, abundant amenities and convenience to shopping, dining and entertainment. Keep up with the latest news & events at Lakeside! Developed by Cathcart & Turner Development Co. and Denico Development Co.